With a gaudy gold dome atop a behemoth white chunk of steel and concrete, we’ve always found the Lebua State Tower to be an eyesore in the Bangkok skyline. At 247 metres — the third tallest in Thailand — there’s no doubt it’s an imposing structure. On the 64th floor rooftop, the Sky Bar bills itself as the highest open-air bar in the world, but is it worth the sky high prices? Feels like Tony Montana should be hanging around here somewhere. As soon as the high speed elevator opened on to the highest floor, a team of six staff members didn’t give us time to blink before asking if we were there for dinner or drinks. After we told them we’d like to perhaps have a drink while checking out a dinner menu, they briskly shuffled us over to the Sky Bar without offering any menus. It didn’t matter — our eyes were immediately fixated on the views. The southerly view — I can see my house! Few if any of Bangkok’s rooftop bars can rival this vantage point. 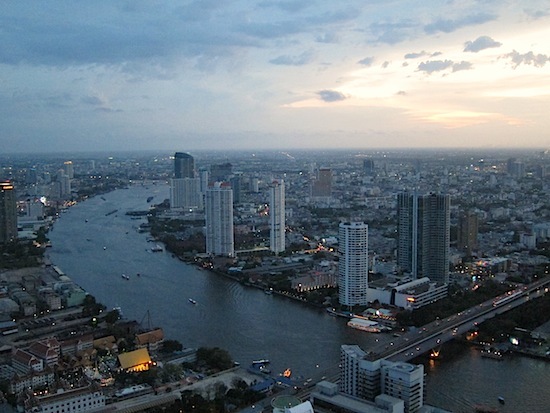 Revellers can watch the Chao Phraya River as it snakes for miles around the Phra Phradaeng (Bang Kachao) area to the south, which appears as an island of forest amid an urban sea. From the other side of the platform, you can gaze all the way north to Rama VIII Bridge and Nonthaburi. Our only complaint is how the big ugly dome blocks northeastern views of Bangkok’s other biggest buildings. Photos are allowed from the bar area. Check out Phra Phradaeng in the distance — a tear drop of green. Set at one end of the high altitude platform, a small circular bar is outfitted with lights that ebb and flow from hot pink to cool blue. While it’s pleasing to the eye, the bar is a cramped affair. It apparently gets uncomfortably packed later in the evening, though there was plenty of breathing room when we arrived around 18:30. No bar stools are available at any time. 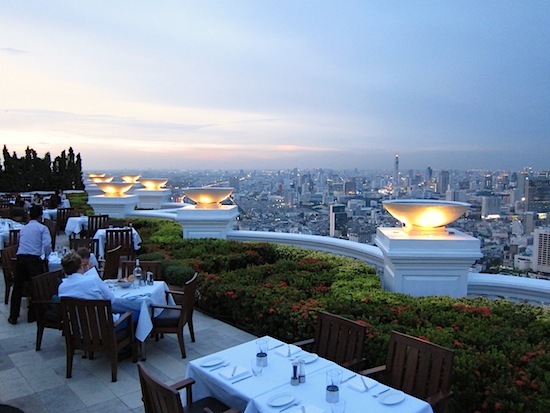 If wanting to take a seat on the same rooftop, you’ll need to at least order an appetiser from the super-pricey menu at Sirocco. Live jazz bands set the mood every night from 19:30 to midnight. Plenty of space if you arrive early. Three bartenders offer a decent selection of wine, champagne and cocktails served in sizable glassware. A “Hangovertini” pays homage to the The Hangover II, which was partly filmed here, though we doubt those dudes would go for the mix of green tea liqueur, apple juice and rosemary honey. Cocktails are done well, but you’ll need to shell out around 500 baht (not including tax and service charge) to enjoy one. At 320 baht, a small Singha beer won’t save you much cash. 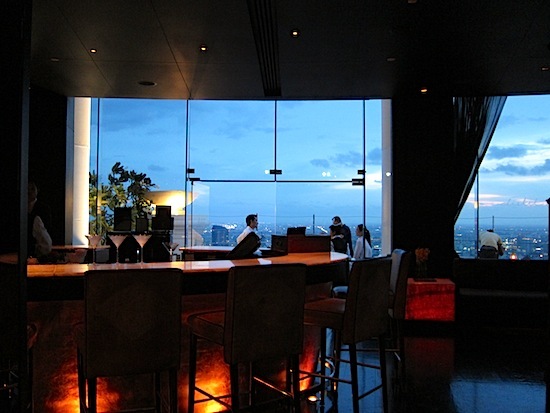 No entry fee is charged at any time, however, so we suppose it’s fair to add a “64th floor fee” into drink prices. If the Sky Bar is too crowded, you might head down one floor to Distil, a more chilled out indoor bar with an outdoor terrace that features similarly commanding views — and seats. Cocktails are also available here, though an outstanding selection of single malt scotches and aperitifs are perhaps more tempting. A chilled out vibe at Distil. Lebua also has four fine dining options to choose from, including Mediterranean cuisine at rooftop Sirocco, award-winning Western-Asian fusion at Mezzaluna located within the gold dome itself, creative pan-Asian at Breeze on the 52nd floor, and a mix of Lebanese, Indian, Thai and pizza at Cafe Mozu on a lower floor next to the hotel pool. With offerings like Hunan-style wok-fried Maine lobster with wing beans, Breeze’s menu looked enticing, and the pyramid-shaped glass wall with pulsating indigo lights is a cool touch. 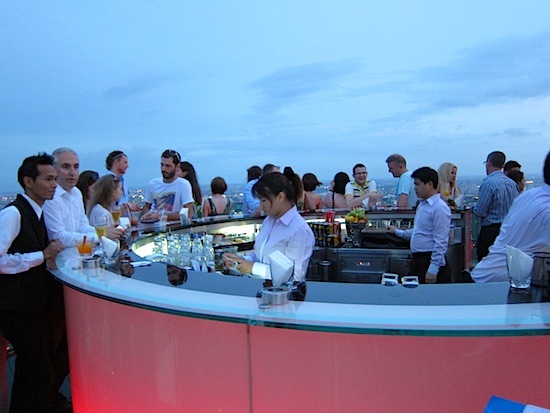 Though the Sky Bar is certainly a touristy thing to do, we didn’t feel the vibe was off-putting. Staff were firm and efficient but also friendly and very polite. We appreciated how entry to the rooftop is free and there wasn’t any pressure to buy drinks. As long as you don’t hang around for too long, it’s possible to go all the way to the top, check out the views and leave without paying a single baht. If you do have cash to spend, this is a fine place for an extravagant night on — or above — the town. 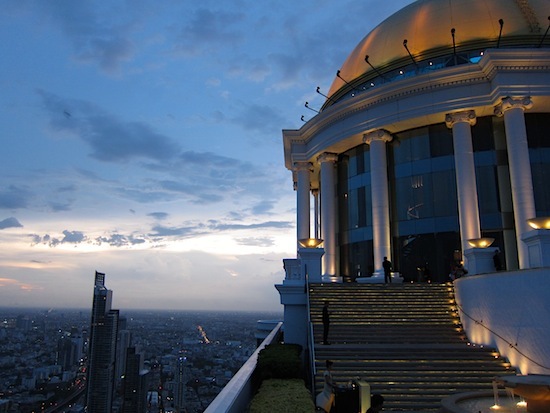 All of Lebua’s bars and restaurants have a “smart casual” dress code. For men, this means closed toe shoes and no shorts or sleeveless shirts, though regular T-shirts are fine. No instructions are provided for women but we’ve heard that flip-flops are not acceptable. 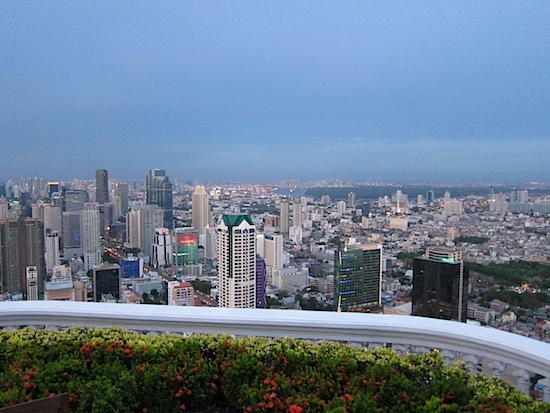 Lebua State Tower is located at the corner of Silom and Charoen Krung roads in the Bangrak area. The main entrance is on Silom and you’ll need to walk through the giant, empty ground-floor to reach the elevators. From Saphan Taksin BTS station, take exit 3 and walk straight at the bottom of the stairs, then turn left on to Charoen Krung Road. Walk north for about 200 metres, crossing the street when possible, then take a right on Silom and the State Tower entrance will be on the right.